Yes! We’ve moved from our original location into our new megastore at 1200 E. Altamonte. Part of the building was formerly Unhinged, but we’ve now taken over the entire 40,000 square foot space, renovated it, and created one gigantic inspiring vintage and home decor experience! We hope to see you soon! Do you have online shopping options for those who live outside the Orlando area? Because many of our items are one-of-a-kind, we do not post them in our online shop as they often sell quickly in the retail store. However, if you see an item you would like to purchase, you can give us a call at 321-203-2525 (Altamonte) 321-203-2526(Winter Park) or 321-422-2710(Winter Garden) and if the item is available we will take care of it for you. We can ship most items to just about anywhere! Are all of your items vintage/antique? Adjectives is a carefully curated mix of Vintage, Antique, New & Unique. Most of our products are vintage, but we also offer high-quality new and unique merchandise, especially furniture and gifts. We offer new furniture items because on many occasions, there simply are not vintage pieces to fit current home decor needs. Partially because people have gotten taller over the last century, vintage and antique furniture items tend to be smaller. Our new items are always the best possible quality, and we strongly favor handmade pieces and pieces made from reclaimed materials (or both). Explore our latest Featured Finds here! Can you order more of the new items? It depends. In the case of furniture, because we favor items that are made from reclaimed materials, we often cannot get them again as there were only a small number made. When you’re making bookcases from old barn wood, there are only so many bookcases you can make! If you want something we’ve already sold, let us know and we’ll try our best to find you something similar. In the case of gifts and decor items such as lamps, we can generally (but not always) order more. Can you order something special for me? If an item is available, we are happy to place special orders. Is this a consignment shop? No. Though our business is based on sales by local artisans, who set up their “mini-shops” inside our store, we do not accept consignment from the public. We are happy to give you recommendations on how you may sell your individual pieces. All of our original art is local. We also feature some decorative art pieces (such as prints or reproductions on canvas) that are not from local artists, but that we love for their sense of style. How often do you get new things? Every day! Our members come in every day to restock, replenish, and rejuvenate. Generally, we do not buy from the public. But, we are happy to recommend local options that can help you sell through what you need. No, Adjectives follows a “Best Price Policy” – our members are required by contract to place their best possible price on each item, so that you can be sure you’re getting a fair deal without having to go back and forth. In exchange, we respect their pricing and we are not permitted to alter it. How does one get a space here? How much is rent? If you are interested in becoming a member at Adjectives, click here! If I buy this and it doesn’t work in my space, can I bring it back? Because of the nature of our business, all sales are final and our members cannot afford to permit returns. However, we will do everything we can to help you make sure a piece is right for you before you purchase it. We’re great at helping our customers find the right piece for any need! If you are working with a local design professional, we may have an arrangement with them under which we will allow pieces to be purchased for a 24-hour “approval” period to ensure that the piece is consistent with your design plan. We are open every day from 10-7, excluding Easter, Thanksgiving day, and Christmas day. Find us in Winter Park, Winter Garden, and Altamonte Springs, Florida. Do you do custom work or refinishing? Yes! Many of our members do custom painting, refinishing, or creation. Because we have such a large community of artisans, we can do just about anything you need! For more info or to get the ball rolling, email us at custom@adjstyle.com. 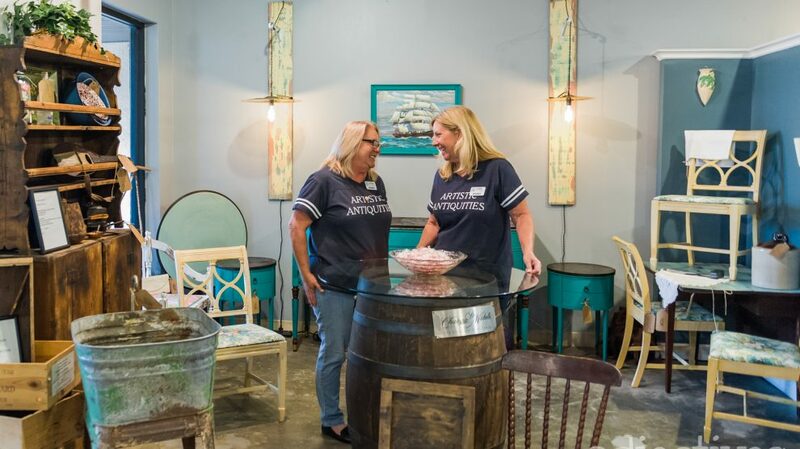 Do you do sell Chalk Paint® by Annie Sloan and painting supplies? Yes! We are a certified Annie Sloan stockist. We carry Annie’s signature paint in every color, along with her waxes, lacquers, and every brush or other painting tools you might need. If you’re new to Chalk Paint®, we also offer creative workshops to teach you how to use this wonderful product!